The word Abraxas is found in Gnostic texts such as the Holy Book of the Great Invisible Spirit, and also appears in the Greek Magical Papyri. The Holy Book of the Great Invisible Spirit refer to Abraxas as an Aeon dwelling with Sophia (wisdom) and other Neons of the Pleroma in the light of the illuminary Elleleth. The meaning of Abraxas in the languages of Greek, Hebrew, Latin and Old Irish/Celtic can be found in the secrets of occult numerology. The first form of the word comes to us from the second century with the words Abrac, or Abracar; a name which Basilides, an early Gnostic religious teacher in Alexandria, Egypt had given to God, who he said was the author of three hundred and sixty-five. In the system of Basilides, being there applied to the “Great Archon” who rules the 365 spheres; the 7 letters spelling Abraxas, and 7 stars often found on Gnostic gems represent each of the 7 classic planets—Sun, Moon, Mercury, Venus, Mars, Jupiter, and Saturn. Sir Godfrey Higgins, in his book the Celtic Druids, had said that the word may have come from the Druids, and he had also shown that the numerical equivalent of the spelling of the name Abraxas has seven letters that equal to three hundred and sixty-five in both the Greek and Hebrew (Phoenician) language. Higgins had said the word ” Abracadabra” is a later corruption of the sacred Gnostic term ” Abrasax “, the latter itself being a still earlier corruption of a sacred and ancient Coptic or Egyptian word: a magic formula which meant in its symbolism “Hurt me not “, and addressed the deity in its hieroglyphics as ” Father.” It was generally attached to an amulet or charm and worn as a Tat (q.v. ), on the breast under the garments. The early Fathers of the Catholic Church such as Irenaeus and Epiphanius had said that the world, as well as the 365 heavens, was created in honour of ‘Abraxas;’ and that Christ was sent not by the Maker of the world but by ‘Abraxas,’ and according to Jerome (c.347–September 30, 420) who is best known as the translator of the Bible from Greek and Hebrew into Latin, ‘Abraxas’ meant for Basilides “the greatest God” (De vir. ill. 21), “the highest God” (Dial. adv. Lucif. 23), “the Almighty God” (Comm. in Amos iii. 9), and “the Lord the Creator” (Comm. in Nah. i. 11). 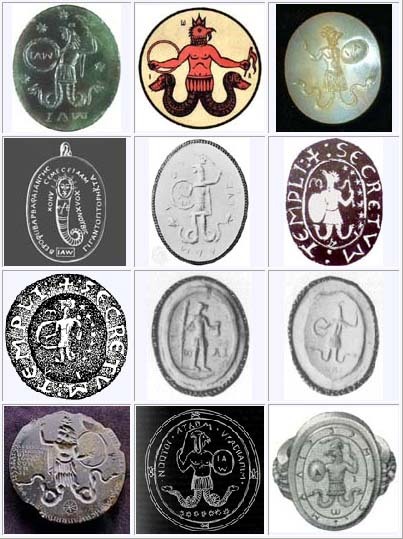 The images that are often depicted along with Abraxas come to us in the form of ancient Talismans usually symbolized as a creature like man with the body of a human being, the head of a rooster, and with each of his legs ending in a serpent that are curved upwards. Abraxas (Abrasax, Abraxis and Latin-Afipacrdl) is an ancient term associated with Gnosticism that had influenced much of what we know of today as the pagan movement and even various religions such as Judaism and Christianity. According to Gnostic principles, the number 365 and the seven letters of the name Abraxas correspond to the seven rays of the planetary spheres in which he is king of the heavens and earth. The original Gnostic religion of Abraxas has its roots in the ancient Egyptian New Kingdon located at Thebes. It was here where they had proclaimed Jupiter to be the supreme ruler of both the AS ABOVE and SO BELOW, in which they had subscribed to him seven subordinate angels (planets). The meaning of Thebes is from the word Theba that signifies ‘Ark.’ The capital of the religion of the City of Light or what we know of as Luxor, where they had worshipped god Amon-Ra (Jupiter-Amon). The seven letters of the name Abraxas reference to 365 is the number of days which the planet Jupiter rules the heavens as the Father and King of planets, and the seven letters correspond to the seven rays of the planetary spheres in which the name Jupiter also has seven letters. Since the most ancient times, the planet Jupiter has been worshipped as a god. In fact, there is not one planet or star on earth that has garnished as much adoration and worship as this one planet. Not Saturn, not Venus and not even the sun. The word Abraxas is just another code name like Amon-Ra (Jupiter-Amon) for this king of the planets that has a thousands names and symbols. Names that all represent the planet Jupiter. In the sixth creation we learn from the Targura of Palestine that Adam, as the Adamic man, was created in the image of the Lord, his maker, with 365 nerves. According to the Talmud, the human body is composed of 248 organs and 365 sinews(a total of 613 parts). In Hebrew, this translates to the 248 spiritual organs and 365 spiritual sinews (under which vague term are included, as stated above, arteries, nerves, etc. ), corresponding to the 365 negative laws, and representing the 365 days of the year. These are governed by 365 angels, one of whom is Samael himself, who represents the ninth day of the month of Ab [the fast commemorating the destruction of Jerusalem by the Romans]. The reason why the sinew of the thigh nerve was forbidden was because it represents Samael [Satan], who is one of the 365 angels, whose day is the Ninth of Ab” and(also, Sammael or Samil) is an important archangel in Talmudic and post-Talmudic lore, a figure who is accuser (devil), seducer and destroyer, and has been regarded as both good and evil. Rabbinical writings describe Samael as the guardian angel of Esau and a patron of Edom (or, the Roman empire). 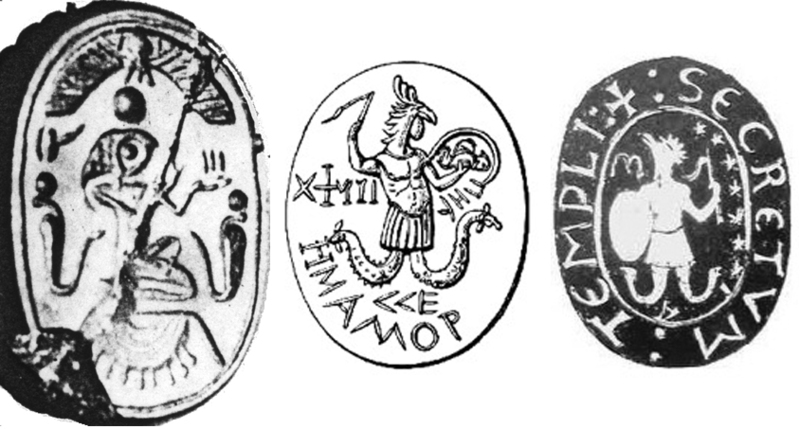 The serpent symbology found on the talisman and gemstones of Abraxas actually represent the worm. In the Apocryphon of John, found in the Nag Hammadi library, the Gnostic Abraxas becomes Samael who is the third name of the demiurge, and whose other names are Yaldabaoth and Saklas. Hebrew names that mean “the blind god.” The theme of blindness running throughout gnostic works, and now appears in a new image of a lion-faced serpent. In On the Origin of the World in the Nag Hammadi library texts, Samael who we know also as Abraxas is referred to as Ariael, the Archangel of Principalities. In the ancient Jewish Gnostic Mysteries, the serpent (worm) was a symbol of Samael, the archangel of Mars and the master of the astral light. One of Samael’s greatest roles in Jewish lore is that of the main archangel of death. He remains one of YHWH’s servants even though he wants men to do evil. As an angel, Samael resides in the seventh heaven, although he is declared to be the chief angel of the fifth heaven, the reason for this being the presence of the throne of glory in the fifth heaven. 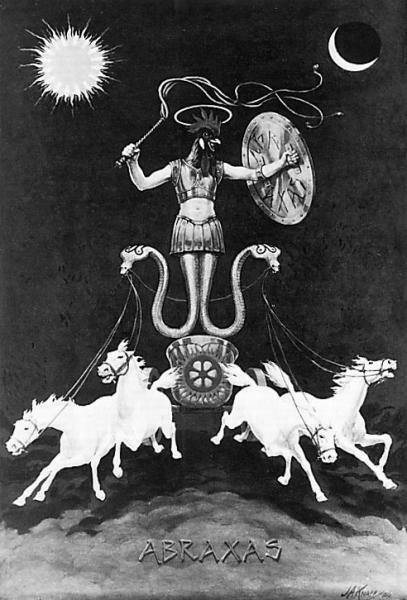 Manly P. Hall had written in ‘How to Understand Your Bible’, “In the 3rd chapter of Genesis the adversary is Samael, the Serpent, and like Mephistopholes it is “a spirit of negation; part of the power that still works for good while ever scheming ill. The old Jewish Mysteries declare the serpent to be a symbol of Samael, the archangel of Mars and the master of the astral light. In scriptural writings serpents are frequently used to represent currents or waves of force moving in space. The Midgard Snake of the Nordic Eddas, and the Orphic serpent twined about the Egg of the Year, are both symbols of the zodiac and the serpentine course of the sun. The erect serpent of Egypt, and the hooded Naga of India and Cambodia, signify the spinal fire in man. The winged serpents of Gobi, and the Taoist dragons of China, represent both the psychic forces of the soul and the initiates, or sky-men. 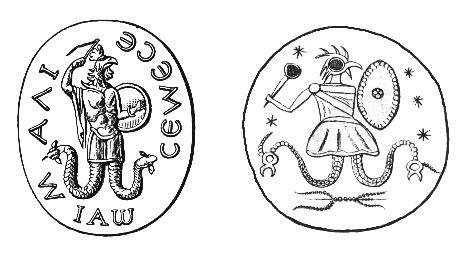 The Indians of the Southwest of America have serpent symbols of similar significance; and the Quetzalcoatl, or Feathered Snake of Central America, is a symbol of the initiate or high priest. The Druid priests of Britain and Gaul called themselves serpents; and these too are the snakes that St. Patrick is said to have driven from Ireland. This is the modern Gnostic theology and science of Abraxas. Abraxas who is the heavenly worm of Jupiter sent from the divine universe to give to mankind the psychic forces to the light of the soul through 365 spiritual sinews (under which vague term are included, as stated above, arteries, nerves, etc. ), corresponding to the 365 negative laws, and representing the 365 days of the year. He is the master of all initiates, or sky-men. Abraxas is the astral serpent on the tree who hands the illumination of both good and evil to Adam and Eve whose eyes are then opened. The very king worm who rules this world, that is both our creator and destroyer. The maker of good and evil rolled into one persona, that being the human population in which Abraxas rules over the world like the great Gnostic Basilides described; “the greatest God” (De vir. ill. 21), “the highest God” (Dial. adv. Lucif. 23), “the Almighty God” (Comm. in Amos iii. 9), and “the Lord the Creator” (Comm. in Nah. i. 11). Abraxas is the Demiurge and Archon Magnus. My name is Abraxas.lol and this kinda creeps me out. But i’ll look it over and over till i really understand it.